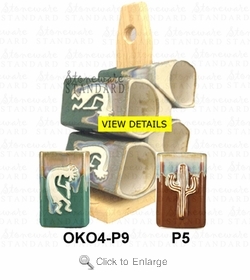 These Padilla Original Raised Relief Design 12oz Mugs - set of four depict two designs, Cactus and Kokopelli. They come in two colors Chocolate and Green. You may order replacement mugs for this set here Padilla Raised Design Original Stoneware Mug.. Understand replacement Mugs may vary in color from original mug set.